To all of my fams (I’ve taken the ‘n’ out of fans and replaced it with an ‘m,’ because a fan doesn’t do anything for me but cool me off when I’m hot and a ‘fam’ is one that supports me), I thank you all for making me who I am today. Without y’all, I would just be an ordinary person in the street, no different and no better than anyone else - the only thing that makes me different is my job description. My life has taught me that nothing is really easy. Everything in life you want can come to you, but you really, really have to earn it and deserve it. You only get to live physically once in this lifetime, so while we are living this one time - we need to make the best of it. When we die, we become nothing but memories to other people and we want to leave them the best memories ever. Anyway, I decided to write a book. 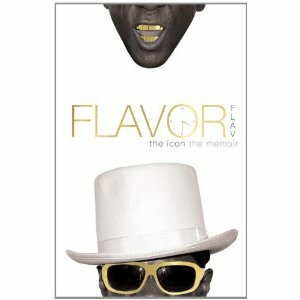 My new book is called Flavor Flav: The Icon The Memoir (Farrah Gray Publishing). My book is edgy, compassionate and often hilarious! My book is a thrill ride from the heights of my stardom to the depths of my despair and Yo! I'm still here to tell it. I've been down some pretty dark holes - but somehow I always found the strength to climb back out of them. God bless you all with your life, your future, your goals, and your families. And once again, I thank you for making me who I am today - Flavor Flav: The Icon. God bless and peace to all. See y'all on my book tour!